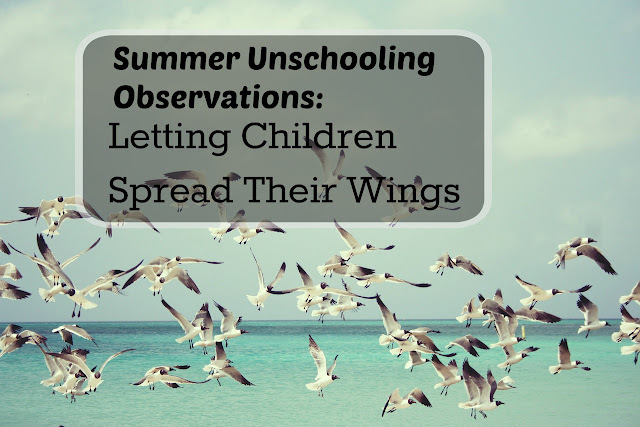 In thinking deeply about taking some real time off from schooling with the boys, it's funny how I have literally stumbled upon blog after blog about helping prevent summer slide, learning through play, letting them lead, not making EVERYTHING educational, & the importance of breaks. I've had people post links to YouTube videos about letting kids be idea makers. I've also, finally, received my requested copy of Free to Learn through our library and spent all weekend reading about unschooling, learning through play, and children's intrinsic desires to learn. Now these are all just simple posts, videos, and a book written by moms, dads, and educators alike about topics I KNOW but it's funny how these reminders seemed to appear before me just at a time I needed to see them. I needed these reminders and am looking forward to taking a good month or more off from school (starting in June). This doesn't mean we won't be doing art or we won't be exploring science and nature. It doesn't mean we won't be taking any field trips or socializing. It doesn't mean we won't be reading either; it just means I'm not going plan. We'll take each day as it comes; in other words we'll be getting back to our summer unschooling roots! I'll be back to following the kids leads and suggesting activities when they come to me asking for ideas. I'm sure we'll be baking up some yummy snacks for when we have friends over visiting (math and reading). I'm sure we'll be going to the beach and exploring ocean life, the science of waves, and testing out the effects of sunscreen. We're planning on making homemade ice cream, hosting an egg drop, bringing paints outside and painting what we see in nature. We're planning to have silly string fights, blow bubbles, play with shaving cream in the sprinklers and all that other fun summer stuff. But I plan to sit back, let the kids lead, and observe all the way in which they are learning. We got a great head start to this over the weekend. when we went on a hike in the woods and observed life and nature all around us-- snakes, fish, plants, and old settlement walls. We saw a heron, a red headed woodpecker, some robins, and other assorted small birds. Sitting on our beach we saw a bald eagle scoop down and pluck a fish out of the pond. Ian was out fishing over the weekend and spotted an otter in the lake. Evan noticed the film on the egg shells as he broke them open to make breakfast. Alec offered to help his aunt plant flowers for her porch. We saw that our caterpillars went into their chrysalises and we moved them to their new home in our butterfly habitat. The boys spent some time observing the ladybug larvae too and seeing how much they grew. All great real- life science lessons. a few ways to have adventures on their own. Ian has been practicing driving his grandfather's fishing boat (with a responsible adult nearby) and has gotten quite good at navigating around the lake. He's learning the rules of the lake as well as the layout of our lake. He's learned how to use the trolling motor and steer himself around with it while casting and fishing. He's getting better at identifying the fish he's catching too. All three boys have been boating and tubing and swimming. They're all very good swimmers and they keep building on those skills and learning new tricks. Other subjects are often covered too. Evan has been reading all sorts of signs and environmental print. He was trying to spell words for his Minecraft game and for his Kindle too. Ian read a book in his room Saturday night-- a whole book! It was a short book but I was surprised to walk in and see him reading all the same. He really enjoyed the Lego book Amazing Battles. Alec has been working at reading his Warriors book at night or in the morning when he first wakes up. The boys have been taking turns playing the Xbox and they've been setting a timer and practicing reading clocks/telling time. They've made breakfast lunch and dinner at various times over the weekend so on top of self help/ life skills they've also had to apply math and reading as needed when measuring or following directions. Evan added 7 +7 to figure out that he needed to cook 14 chicken nuggets by telling me that if 6+6 = 12 then 7 + 7 must be 14. Alec helped me work on a complicated jigsaw puzzle and put in quite a few pieces helping develop some problem solving skills. We've been discussing possible family vacation plans and in doing so have talked about geography and history. In watching & observing & letting them lead, I have observed them naturally applying math, reading, science, home economics, and geography--- and that's just been for the last two days! Such a fun and encouraging post! Thanks for this peek into your family life! Thanks! I always find us sliding into this sort of a routine around this time of year as all of our traditional schoolwork starts winding down. It is amazing what they are really learning when we do not schedule! It really is! Today my middle son learned to drive our lawnmower and mow the lawn while our youngest learned to run the excavator. All of the boys learned how to fix a weedy garden and how to work together too. That snake would have given me a heart attack! When I was reading this I thought that so many of these skills and learning opportunities through play and everyday life can really help the kids and you start to really be in the moment and pay attention. Being present and paying attention is something that can be a little lost in today's world. I know I struggle with it. Thanks for sharing with us at #LiveLifeWell. I definitely struggle with being present and in the moment too but I find that is when I am most tuned into what they are learning.